Today was the Hotelympia 10K around Docklands/Canary Wharf/Millenium Dome area. Woke up to the rain lashing down and even used an umbrella to get to the train station the conditions were so bad. Running with the wind and rain in your face is not always pleasant. 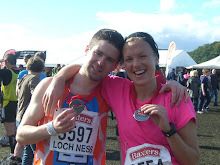 But a great result despite a number of factors counting aganst all runners. I was quite surprised to get my best 10K time ever, exactly 37 mins. Was a little disappointed that it wasn't a second less as there were plenty of places I was robbed of a second or 10! Race started well and I was up with the first 5 runners. But then asbolute disaster struck as just after we did a u-turn the guy in front of me who I was following went up a random flight of steps! Quickly we realised this was the wrong way, then guy fell down the stairs and ended up knocking over a squaddie coming in the opposite direction in his full kit! We got back on track eventually, but certainly took a good few seconds off and that wasn't the last time the direction was unclear. A few Ks on I was on my own with no one to folow and ended up going the wrong way again - until a marshall finally pointed me in the right direction. Was really proud with today's effort though because of the way I finished the race. I had 2 guys just in front of me, getting away from me steadily. I'd hit the wall but somehow, I managed to find some energy and pushed on in front of them with 1K to go. I stayed like a race horse and even managed a sprint finish! Very encouraging as I now know I'm capable of 36 minutes so onwards and upwards and maybe sub-35 is achievable! 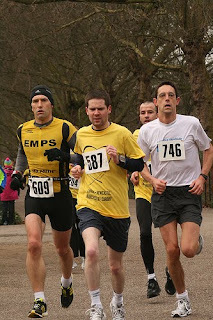 So had my first race of the year yesterday morning in Battersea Park and the results are in. My preparation wasn't great after I ended up having to do a sprint to get my train, which I should have been saving for the finish line. Was pretty happy with how it went though as I managed to keep my pace up between 3:30 and 3:50 per km for the entire race. Only disappointment was the fact that I was battling with 2 guys for most of the race, nip and tuck, all over-taking each other a few times - then as I was behind them the finish line crept up on me. So I didn't start my sprint finish until about 50m to go! And I ended up finishing right behind both of them within a few seconds. But good start to the year anyway and I've learned from it for the next race. A big step forward in my training tonight. Went up to Battersea Park running track and did 5K in 17:42. My aim as part of training for a sub-35 min 10K is 17:30 for 5K so I'm not far away now. It was in the driving wind and snow as well, so was a very tough session! Looking at projected times using the Pete Riegel Formula, I should be able to hit 36:52 in a 10K, over 30 seconds quicker than my PB of 37:33.